After announcing its very first fleet of driverless cars, Uber has reinforced its commitment to stay at the forefront of innovative inter-city transport by revealing that it's researching short-haul flights using vertical takeoff aircraft. The company's head of products, Jeff Holden, spoke with Recode at the Nantucket Project conference, telling the publication that the idea behind the service would be to offer customers "as many options as possible to move around." Vertical takeoff and landing aircraft (VTOL) are very much a "do what it says on the tin" kind of vehicle, using rotors and fixed wings to ascend and descend like a helicopter but fly like a plane. 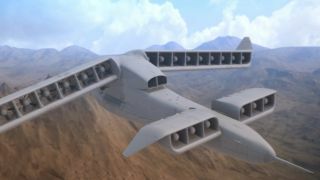 The benefit of VTOL aircraft is that they don't require any kind of runway to take flight, however, they do still need a good deal of space to operate safely – something which can be quite hard to come by in busy cities. Holden's solution to this would be to use rooftop spaces as takeoff and landing pads, adding that he believes that VTOL aircraft could be used commercially within the next decade in a system similar to UberPool. Still, even if the technology is reasonably far along, bearing in mind spatial practicalities, air space legislation, and safety regulations, it seems reasonably safe to say that seeing these vehicles in common commercial use within ten years is an ambitious goal. We're having enough trouble with drones at the moment. It'd be a massive improvement on getting the subway, though.